Q: Describe yourself in a single Sentence? A:”This actually gave me some thought! the best way to describe myself is very scheduled and orientated notification around my phone. That is how I like to live my life right now! 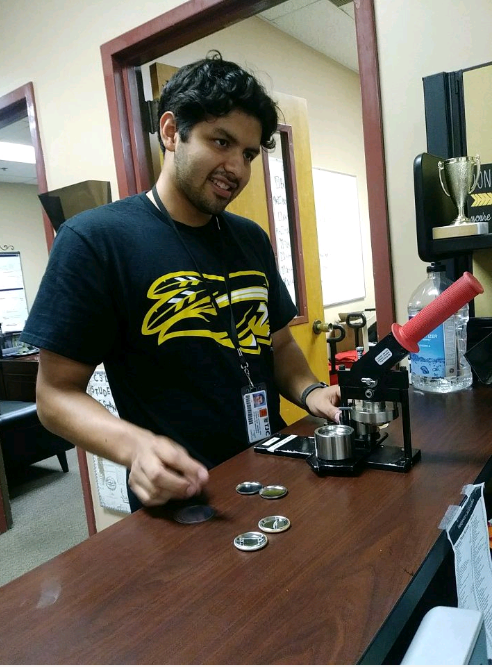 Student Senate President, Christian Marez, makes buttons for homecoming. A:So this is going to sound weird but I go to the gym every now and then and a lot of people make jokes about calves. So this past summer one of the students made a comment on how the Chiefs have nice legs and I took it directly to me! Q: Where is your Favorite Place to eat in Tyler and What is your favorite thing on the menu? A: Now this one was an easy one!! It is Go Fish! I get the simple stuff. I go around 2 -5 for their happy hour I can get 3 rolls for $13! I like to get a Louisiana roll and 2 California rolls. Q:How has your birth order and the characteristics of siblings affect your position today ? A: Kind of and kind of not. I am the oldest brother, so I guess, leading the way for the younger ones is kind of what puts me in my head. So I guess, if they see me doing something – I am going to college and being involved then when they come into college then they will do the same thing, hopefully! Q:Has this position shaped you in how you are around your siblings? A: Yes. Now I kind of acknowledge more how I am acting around them and being more of a figure for them, not just a brother that isn’t there. I want to be that roll model for them. Q:What is the hardest part of your job being the New President? A: Well I guess it is just keeping up with what Patrick, our last president, was already doing and keeping connections. it is kind of weird stepping off on the same foot that he was going on. He had things done a certain way and everyone is a little different and I am a little different. So just catching up to his speed will be a little difficult for me. Q:What are your goals for this semester as said “New President”? A: We have some Ideas for some new resolutions to go out on the campus. Updating the library and we want to make sure it is going the right way. On top of that we really making sure and getting campus ADA Safer. We want to make it more suitable for the students as soon as possible. Q:You seem very busy! It took us 2 different attempts to make this happen! How do you feel with it all, Happy or overwhelmed? A: Little of both. When I wake up in the morning it is kind of dreading, like, oh man i have to get up in the morning again. I lay there for like 15 mins but once I get up and start going it is helpful because I am not malingering around campus. I am always moving or something is on my mind. So it helps me to keep going and reminds me to stay on top of my homework and other responsibilities outside of the organization. Q:If you could change one thing about the world, regardless of guilt or politics, what would you change? A: Oooo! This is a hard one. I guess it wouldn’t be a change it would be more pushing of community service. Giving back to it. I know we are big about that around TJC and I would kinda like to bring that around and more to the city of Tyler! Q:How would get the community involved? A: See, I am a sucker for dogs!! Honestly it would have to do with something with the animal shelter or something around there! I think they are more helpless then people since they can’t speak for themselves. We need to speak on their behalf. You know dogs are loving, unconditional!